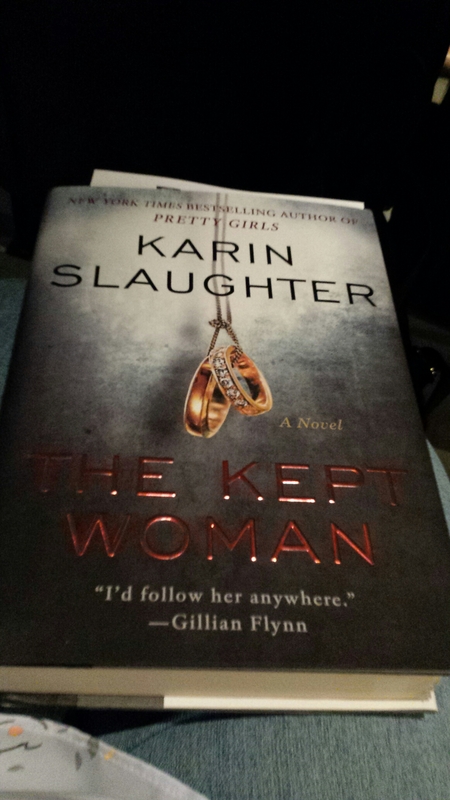 At a book signing meet and greet Karin Slaughter…free book..The Kept Woman….can’t wait to read. Thank you Edelweiss for allowing me to read and give an honest review. There is not a reader in the world that hasn’t dreamed of owning their own bookstore. They want to pass the joy of reading to another person. Nina lives her life in books, she reads every single minute she can. She is trying to figure out what to do with her life, and sees an ad for a van and a idea pops into her head. She travels to another part of Scotland and finds a village full of characters and finds her home. She finally feels like she belongs. Nina decides to buy the van and have a traveling bookstore, she fixes it up and starts to travel and sell books. I love the authors writing, she made these characters lovable, funny, normal, and full of love and surprises. Nina is such a great character, she is adventuress, funny, ready to take chances. enjoyed getting to know the character’s. I wanted to know what happened to Frieda and her sister Bea, and Sam. I look forward to more novels written by “Ann Howard Creel”. I love Frieda’s character, she is so strong, and feels that she has very few options, she wants to fish, she feels at home on the water, but Silver sells his boat to Sam, she’s heartbroken. Frieda decides to learn to become a mechanic, to work on boats. This is during the Prohibition time, and Frieda decides to become a rumrunner. She feels this is the only way to take care of her and her sister. She wants a better life for Bea. falls in love. She finds out a lot about herself. There is some romance, some family drama, some history and adventure, you will enjoy this novel. If you’ve read either book, what did you think? Thanks to NETGALLEY for allowing me to read and give an honest review. I am a big fan of Carolyn Haines, I have read all of her stand alones and all of her Sarah Booth Delaney series. I love her writing style, her southern humor. This is the 1st book in a new series, that I look forward to the next one. This is the story of a house full of a lot of dirty secrets. Raissa James loses her husband Alex, and decides to visit her Uncle Brett, who owns “Caoin House: in Alabama. This house is definitely haunted, by ghost trying to get the truth out. Raissa is a very sensitive person , she begins to see ghost from people that lived in the house. There is humor, tons of mystery, quirky characters, murder, greed, ghostly creatures, and a little bit of a love story. I am posting reviews tomorrow, Sunday, 9-11…. Thanks to NETGALLEY and LAKE UNION PUBLISHING for allowing me to read and give an honest review. love and full of surprises. her so much stress, and Toby is her sounding board for everything she goes though. Every person needs a friend like Toby. everyone in the story, and I cared about them all, I wanted to see happy endings all around. story, and a book that shows us just what a dog gives us everyday, love, loyalty, acceptance, no judgement, forgiveness and pure joy, you are going to love reading this novel.. I have been trying to blog my reviews on Saturday or Sunday. Some weeks are better than others, I’ve thought about posting blogs about my life, but I really have no life, I work third shift, I work loads of overtime, sometimes sixteen hours a day. This is what makes it hard for me to blog, I am going to get a new phone, and I’m hoping I will be able to blog more frequently, putting more reviews and maybe tidbit’s of my life. I will be trying to put my reviews on within the next few days, so hopefully you all will be patient with me. Thanks for listening ad have a great Sunday!